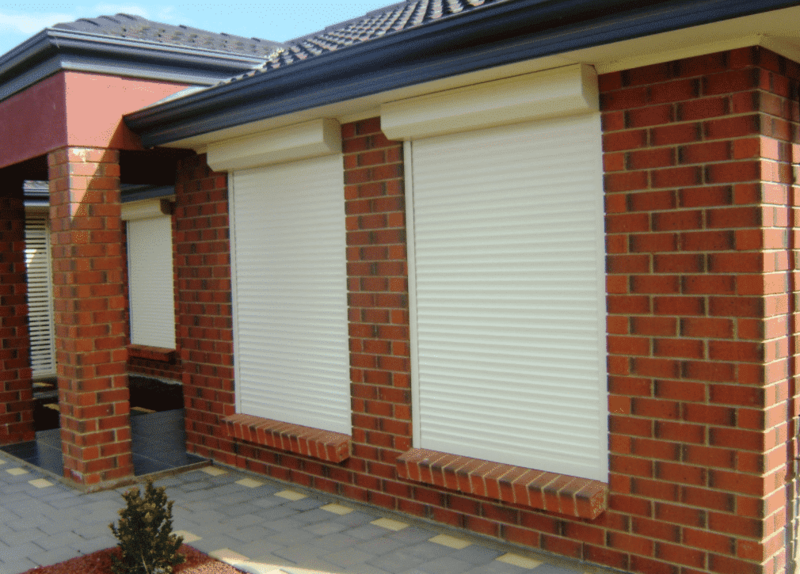 Roller shutters are a common feature of many homes in Australia. Just take a drive in your car and you will notice many houses – both modern and classic, with windows that are fitted with shutters. Modern shutters come in a wide variety of sleek designs and colours that can be adapted to suit the interior décor and external façade of a home. Shutters are also commonly used on business premises, such as offices, cafes and retail outlets – for the added level of security they offer. Do you need shutters for your home? It really depends on your personal preferences and objectives as a home owner. Let’s look at what benefits shutters provide, and how you could use them in your home. A roller shutter is a type of door or window shutter that consists of many horizontal aluminium slats hinged together to form a partition or external covering. Shutters can be operated manually or motorized. Traditionally, shutters have been more often used as added security for doors in business premises. This has somewhat evolved with the introduction of window shutters which are becoming more popular. These shutters provide shade, insulation and added security to any window space in a home. Below are some of the benefits of shutters and why you might consider installing them in your home. They not only look great on any window and provide shade from the sun, they can add value to your property, by making your home more secure. Ever had that headache that came with catching a flash of light at a wrong angle with your eye? Glare is one of the leading causes of headaches, especially during summer or hot spells, when the sun in full blast. Many home owners have resorted to blockout blinds that help reduce the outside glare. The problem with these blinds is that they only block up to a certain level of light. What happens if you need a room to be even darker? For example, for a home theatre or young sleeping children. That’s where roller shutters come in handy. Shutters are ideal for blocking out light. Made from thick aluminium sheets, they are able to block out almost all light completely when fully drawn. With shutters, home owners are in control. You can lower the shutters to a level that suits your preference. Letting just enough light into a room – without causing any discomfort. During the hotter seasons, most home owners will keep their windows closed in order to keep warm air from entering their home. However, heat still enters the home – and quite rapidly, through the window panes. On a hot summer day, windows generate far more heat than the walls of a home, and this heat passes into a home rapidly, causing the ambient temperature inside to rise quickly. This could translate to significantly higher electricity costs, as air conditioners become heavily taxed, as they work hard to cool down a home. Roller shutters can significantly reduce heat build up within a home because of their thick aluminium slats. These slats act as a barrier and provide a high level of heat insulation – significantly reducing the heat passed on to the window pane. Many users of shutters have commented on how happy they have been since installing them – and how shutters have kept their home much cooler during the hotter days. Installing roller shutters is also an effective theft deterrence as your property would not be seen as an easy target. A high percentage of break-ins have been attributed to window intrusions. It’s easier to break in through a window – and the fly net doesn’t really offer any added security! Shutters provide a high level of security and protection for windows and doors. Not only do they help to prevent unwanted access, they can also protect your windows from accidental damage. Potential window breakages can be a result of kids kicking a ball around or when you have construction works going on in the yard. Quality roller shutters, like those installed by Australian Outdoor Living, are CSIRO fire rated. Built to the latest regulations, our shutters provide a high level of protection from fire threats. CSIRO fire rated shutters are especially necessary if you live in a bush-fire prone area. Give yourself and your loved ones that added peace of mind knowing that your home is well protected by quality shutters. Roller Shutters: Noise Reduction and Privacy. Roller shutters not only block out light, heat and intruders, they are also highly effective in blocking out sound. Premium quality shutters can reduce noise by up to 50%, and are ideal for use with home theatres, nurseries and study rooms. Need added privacy and lower noise levels in a room? Just install a good set of shutters and you will experience true tranquillity – in your own home. Firstly, think about where you would like to use them. You may not need shutters installed on every window. You can just install them in the rooms where you require more privacy, shade/heat and noise insulation. Then decide if you need a motorized shutter, or if you are fine with manual operation. The Strap Winder is a common manual operation choice for double brick homes. You can also choose from a wide range of colours whether you would like flat or curved slats and highlights or no highlights. These configurable options allow you to fully customize your shutters to your exact preferences. The best approach is to get one of our professional installers to do a free measure and quote on-site. This way, you can be assured that the measurements are correct, and get an accurate quotation at the same time. Need more information about shutters? Let Australian Outdoor Living answer all your questions! Visit our roller shutters product page or contact us today to speak with one of our Design Consultants. We will also be able to arrange a convenient time for our installers to come to your place – and provide you with a free measure and quotation. Read this blog for a guide on buying roller shutters. *Please note that the full range of Australian Outdoor Living products is only available in South Australia. Check with your local Australian Outdoor Living team on product availability in your area.